ASSHOLES WATCHING MOVIESInherent Vice is finally playing in Ottawa! 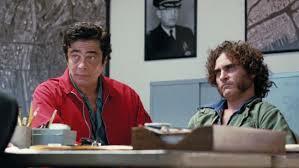 Inherent Vice is finally playing in Ottawa! I couldn’t wait to see this. I thoroughly enjoyed Thomas Pynchon’s beautifully written but always entertaining novel and couldn’t wait to see what the always unpredictable writer-director Paul Thomas Anderson was going to do with it. PTA hasn’t been very accessible lately with almost painfully slow and light on dialogue movies like There Will Be Blood and The Master. I have watched and rewatched those movies and think they’re great but will still always prefer his more exciting earlier work (Boogie Nights, Magnolia). 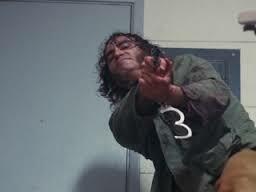 Inherent Vice, about an almost constantly stoned hippie private eye working a hopelessly confusing case, seemed like it might be a bit of a return to form. Although probably much more engaging to mainstream audiences, Inherent Vice still has more in common with The Master than it does, say, Boogie Nights. It gets our attention immediately with missing ex-girlfriends, frameups, murders, and an ominous message Beware the Golden Fang! It gets more and more demanding as it goes on however, as Doc gets more and more information through a fog of marijuana smoke and it becomes tougher and tougher to tell the reality from the hallucinations. The mystery held my attention even as I started to lose my way. The cast of interested parties and suspects started to become unmanageable for me and, although all the bizarre supporting characters are well-cast and usually compelling, I lost track of them all at a certain point and even now couldn’t tell you how they all fit in. In fact, I am pretty sure it doesn’t all fit together. What’s most impressive about Inherent Vice is that I barely noticed how lost I was while I was watching it and it was only when jay asked me afterwards “So, what did happen to Mickey Wolfmann?” that I realized that I didn’t really know. I just enjoyed watching Doc (Joaquin Phoenix) trying to keep it all straight. The story is really about Doc, a hippie in 1970 when hippies were a dying breed. Its a great character for Joaquin, who plays him as niave in an increasingly cynical world and as surprisingly sharp sometimes, despite being bumbling and as lost as we are most of the time. The situations he finds himself get increasingly absurd and hysterical but there’s always a dark and foreboding tone- sometimes in the background, sometimes front and center- that is made even trippier when seen through Doc’s stoned confusion. As a whodunnit, Inherent Vice doesn’t make a lot of sense and doesn’t answer the question it raises clearly enough for most people’s taste. For fans of Paul Thomas Anderson, though, it moves his career in a new and interesting direction and I can’t wait to see how he’s going to try to follow this. This entry was posted in Movie Reviews and tagged Benicio Del Toro, Joaquin Phoenix, Paul Thomas Anderson on January 16, 2015 by Matt. I’m still reeling from this one. We got lots of puzzle pieces, but no assembled product. And I think I’m okay with that.